It is freezing! I've just made coffee to warm my cold little hands! The polka dotted cups gave it away. I was looking at your very neat pink mixer! Yummy cupcakes - I wish I could reach into your photo and lick the bowl! I hope they warmed you up. 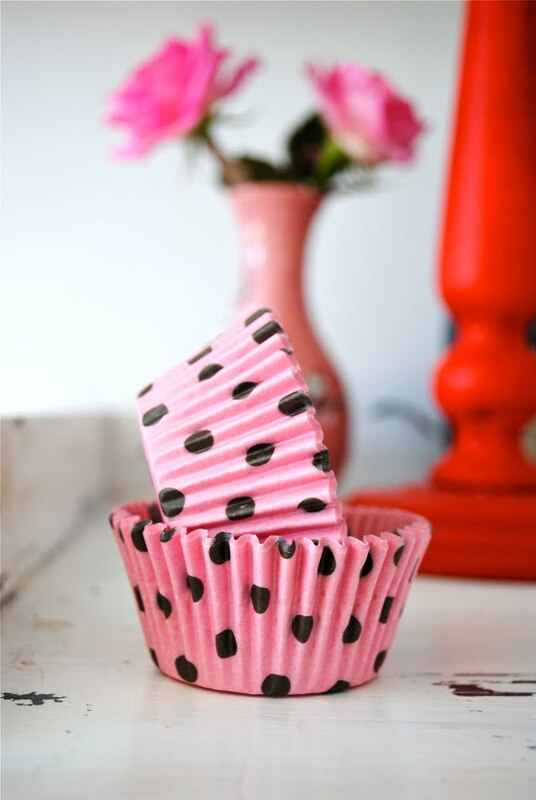 Polka dot cupcake holders, how cute! I'm sure your family is going to love those pink cupcakes. Oh, my...a pink mixer?! Love it! Kisses from Brazil! 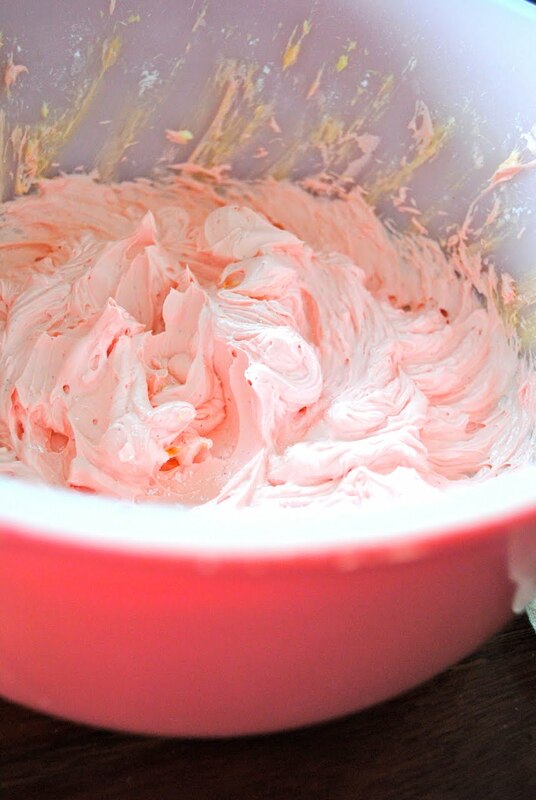 every time i see your wondrous pink mixer I get a twang of jealousy!! hmmm? no, i can't! but i baked blueberry muffins. i'm loving the slight chill in the air where i am. CUPCAKES!!! There is a new show on the Food Network all about CUPCAKES.. :) oh am I right? I bet it is not as cold at your place as it is in Canterbury! um, you made cupcakes? ;) I ate cupcakes today, I baked them last night...orange flavour. I also made M&M cookies. I feel a bit sick now, lol. adorable cup cake holders. Hot a h... here in Texas, hoping for a little rain to cool things off. Yep and I'll have one thanks :) okay maybe two. Just love pictures of your beauty of a mixmaster..fab! Whatever it is I feel like eating that!!! How lovely and delicious post!! Kiss, Bela. It has to be yummy since you are using that fab vintage pink mixer!!! whatever it is it looks lovely! Love your mixmaster and those polka dot patty pans! May I have one when they are finished. MMM Simone...sponge cupcakes with pink frosting? I bet there is a twist & i am stating the TOOOO obvious.. PLEASE tell me that HOT PINK mixer IS NOT real! Please tell me it's not real so I will still LOVE and adore my brand new CHROME Kitchen Aid Mixer! Oh I just can't take it if that's REAL!!!!!!!!!!!!!!! Ohhhhhh, do I love that pink mixer! Very cool! Oh love the pink mix master! Yes, I am feeling the cold too. Make sure we get some after shots of the yummy cupcakes! Those are the CUTEST cup cake liners! Where did you get them? Cant enough of that pink mixer, love it. oh,yum! I want one for breakfast. 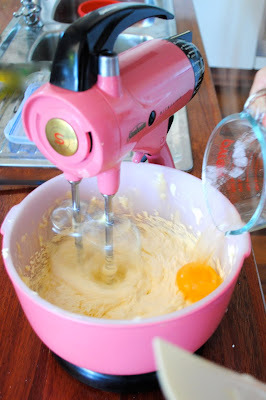 I am just coveting your pink mixmaster...what a beauty! Come and visit our less than three month old blog, Katsui, sometime. It's not really all about out jewelry! Honestly! also in the kitchen l enjoy your style!!!! !beautifull cupcakes!!!! every body happy,nO?????? besos enormes simonne!!!! Ohhhhhhhh......that mixer is soooooo adorable. Let's see...could it be cupcakes??? I love that mixer and those are really cute cupcake liners! Love the mixer!! My guess is strawberry flavored cupcakes in those oh so cute cupcake papers. Love that mixmaster, like everyone else. I found a 1970's avocado mixer like this in excellent shape under the dirt, for $2.00 at a yard sale. Why can't stuff like that happen every day? I'm afraid I'm going to have to repeat what almost everyone else has said and say that I absolutely must have that mixer! It is gorgeous!! ... and the polka dot cake cases are so cute too! all i know is i want to like the beaters! YUMMIE! I love your pink mixer!!! I love your pink mixerrrr!!! And all your blog is adorable. I have been eating comfort food for a week. Love it when you break out the mixer!